Shaun P. Merriman, Gateway Bank president and CEO and chair of the 2015 Sarasota/Manatee Heart Walk, led the area’s most successful Heart Walk to date, raising more than $215,000 and crushing the fund-raising goal of $195,000. 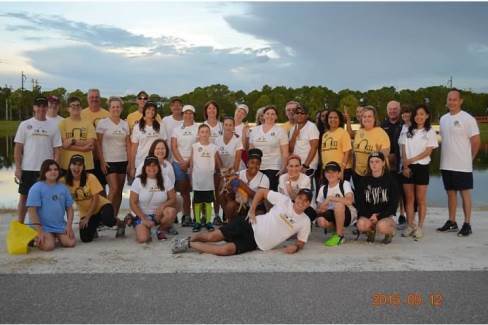 This year’s walk was held at Nathan Benderson Park, helping to draw teams and participation from both counties; 147 teams comprised of approximately 1,300 walkers participated. Funds go toward lifesaving research, community programs, educational resources and advocacy efforts. The Rotary Club of Bradenton is partnering with Pier 22 on Saturday, Oct. 24, to host “The World’s Greatest Meal to End Polio” in honor of World Polio Day. Pier 22 will donate a portion of the day’s proceeds toward ending polio. The Bill & Melinda Gates Foundation will match every dollar raised two-to-one. The Rotary Club of Sarasota Foundation has committed $60,000 to All Faiths Food Bank’s School Pantry Program to feed hungry students and their families. Rotary Foundation president Jim Henry announced a challenge to local businesses, clubs, associations and the community at-large to adopt a school and provide the funds and volunteers to operate the pantry; up to $20,000 for the creation of the new school-based pantries will be matched. Visit rotaryclubofsarasotafoundation.org or allfaithsfoodbank.org for donation information. The Sarasota Ballet’s Dance–The Next Generation program, which has provided a safe haven for children at risk of dropping out of school, has partnered with All Faiths Food Bank to support the nutritional needs of more than 200 students at no cost to the program or the child. This partnership with All Faiths Food Bank will free up more than $10,000 which will go toward the instruction, dancewear and transportation for this rigorous program.